Really, I’m not sure if there’s a more literal interpretation of “coffee cake” than this one… except for maybe a cake made with coffee. Seriously. You see a lot of coffee cakes, and they’re all meant to be served with coffee, hence the name… but this one is truly a coffee cake. 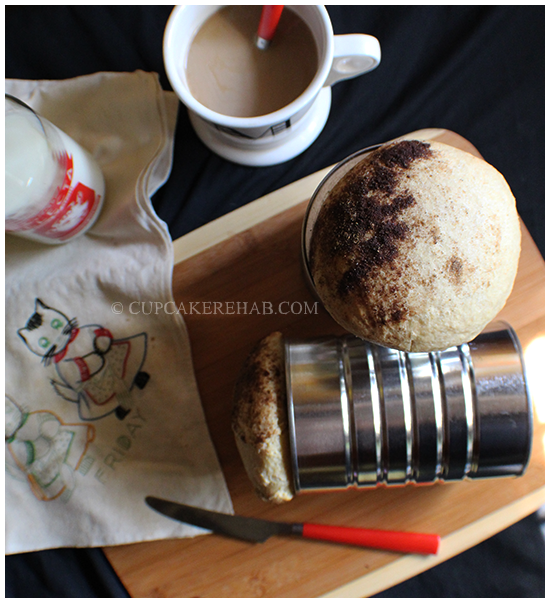 Or rather a coffee can cake. 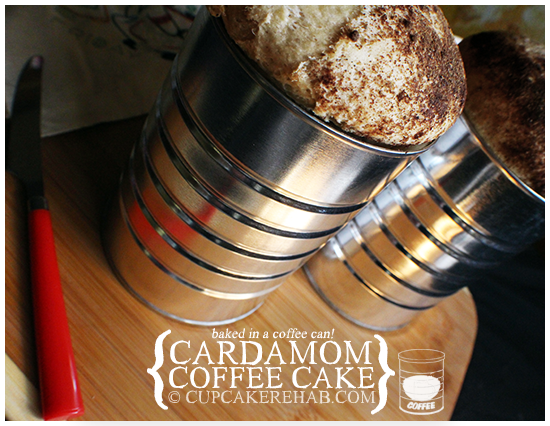 It’s a coffee cake baked in a coffee can. How cool is that? Pretty friggin’ cool. I saw this during my travels on the inter webs & I thought, “That’s so cute!” Yes, I had heard of bread or fruitcake being baked in coffee cans before, and my mom used to do it. 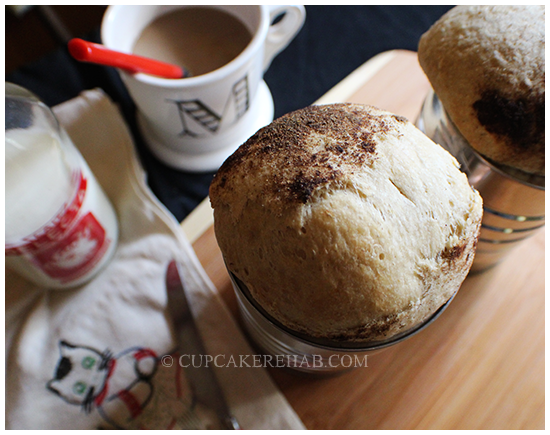 But I thought making a coffee cake in a coffee can was super adorable. And interesting. Something I’d never done before. Only problem is: I don’t have any coffee cans. I have a Keurig, and when I do buy coffee it’s bagged. The only can I have is one from Cafe Du Monde & I’m not using that for baking. So I had to enlist my father to see if he had any of his trusty Chock-Full-O-Nuts cans laying around, which thankfully he did, and tons of them at that (although I’m still not sure why). Unfortunately, your average coffee cans have gotten smaller lately… from one pound to 11.3 ounces. It doesn’t really make much of a difference to this recipe, however, so if you’ve only got 11-ounce coffee cans, don’t freak. It worked out just fine for me! Yeah, there was some overflow. But not enough to really matter. If you’ve got one of those really big coffee cans, maybe you can make the entire recipe in one can? Not sure, but I don’t see why not, as long as the large can is at least double the size of a regular one. Soak the coffee cans in hot soapy water to clean them and remove any labels and/or glue. Please do not attempt to make these with the labels still on the cans. Dry the cans thoroughly in a warm oven. Heavily coat the interior of the cans with the soft butter (3 tablespoons) once they have cooled. To make the dough, combine the buttermilk and butter slices (1/2 cup or 1 stick) in a small saucepan over medium heat and warm the mixture until the butter slices start to melt. Set the pan aside. Combine the warm water, 1 teaspoon granulated sugar, and yeast in a 4-cup liquid measure and stir until the sugar is dissolved. Set the mixture aside. 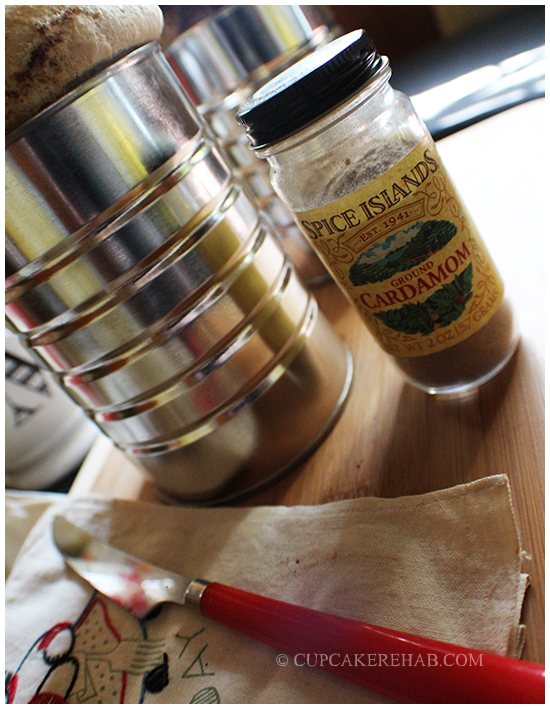 Put the flour and the cardamom (1/4 teaspoon) in the work bowl of a food processor fitted with the dough blade or the steel chopping blade. Pulse the machine on and off three times. Add the brown sugar, salt, eggs, and yeast mixture to the flour mixture and process for 1 full minute. With the machine still running, slowly pour the buttermilk mixture through the feed tube, then immediately turn off the processor. Scrape down the sides of the work bowl and add the raisins. Pulse the processor on and off several times or until the raisins are distributed throughout the dough. Divide the batter between the two prepared coffee cans. Cover the cans with a tea towel and set them in a warm, draft-free place to rise for 45 minutes, or until the dough has risen to within 1 inch of the can tops. When the dough has finished rising, remove all but the lowest rack from the oven and preheat the oven to 350F. To make the topping, melt the 1/3 cup of butter and brush it over the top of each coffee cake. Combine the granulated sugar (5 tablespoons) and spices (1 teaspoon cardamom and 1/2 teaspoon ground cinnamon) and liberally sprinkle each cake with half of the mixture. Bake the cakes in their cans for 35 minutes, or until the tops are a dark golden brown. Thump the tops as you would a melon and listen for a hollow sound, like a ripe melon. If you do not hear a hollow sound, bake the cakes for another 8 minutes and test again. Cool the cans for 1 hour on a rack, then unmold them. Next time I would make a streusel for the topping, instead of what’s given in the recipe. It tasted good, but it didn’t look that great. I just think it’s better suited to a chunky, spicy, sugary streusel instead. Oh, if only. Hindsight is 20/20! I also didn’t use the raisins. I just don’t like raisins. But if you do, then throw those suckers in. See? Not a very… well… flattering photo. By the way- speaking of what I didn’t use… I didn’t use a food processor, I used my stand mixer with the dough hook, and it worked out just fine. If you don’t have a stand mixer, you can use a food processor and vice versa. And you might have some trouble getting the cake out of the cans. I had some trouble myself, but I just finagled it by cutting the tops off first, then taking the rest out. Then I just sliced them all up right away for serving. But eating them right out of the can with a couple of forks isn’t the worst thing to ever happen, is it? And of course, they’re served with COFFEE. 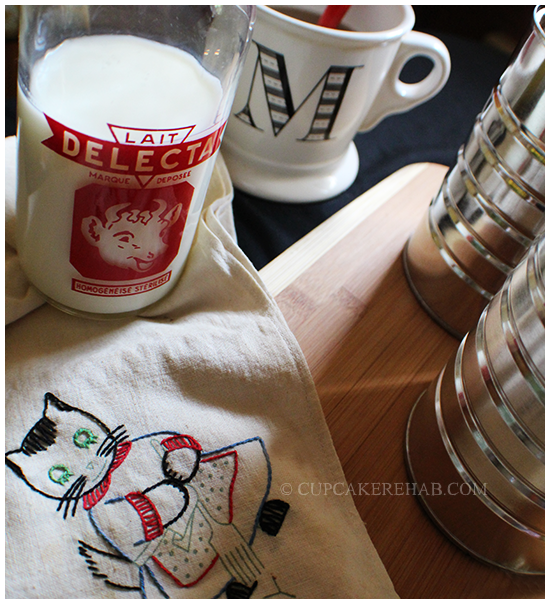 And it’d be perfect with some of that Swedish style homemade flavored milk. Previous Post Vanilla-strawberry jam cakes. Next Post Maple-whiskey pickles; version 2.0. Such a great idea and it looks delicious! Magnificent items from you, man. I’ve keep in mind your stuff prior to and you’re simply too wonderful. Thanks for all of the hard work on this website. and as well attract response from website visitors on the matter then our favorite child has always been studying a lot. the nice high quality writing, it’s rare to look a nice weblog like this one these days. say clever stuff. I will make sure to bookmark your blog. post’s to be exactly what I’m looking for. Do you offer guest writers to write content for you? at web, except I know I am getting know-how every day by reading thes pleasant articles or reviews. am having difficulties with your RSS. I don’t understand why I cannot join it.